P010: THE SHORTEST PATH BETWEEN 2 POINTS IS THROUGH THE COLON? REALLY? Introduction: There are many pathological processes that intrathecal pumps are used for, including: chronic back pain, spasticity due to cerebral palsy, stroke, traumatic brain injury, spinal cord injury, and multiple sclerosis (1). There have been many reported complications described in the literature, usually related to catheter malfunction or pump-catheter connection problems (1). There have also been two cases described in the literature of the baclofen pump itself eroding into the peritoneum (1, 2). There are various incidences noted in the literature of baclofen tubing migrating intrathecally, causing subarachnoid hemorrhages and various other complications (3,4,5). However, to our knowledge, this is the first time that the baclofen tubing has been described to erode through bowel. We describe a case of a 63-year-old woman who was undergoing an elective, outpatient colonoscopy for screening purposes. She had a long-standing history of constipation and intermittent blood in her stools. Her baclofen pump was placed 2 years prior as part of treatment for primary lateral sclerosis (later definitively diagnosed as multiple sclerosis). 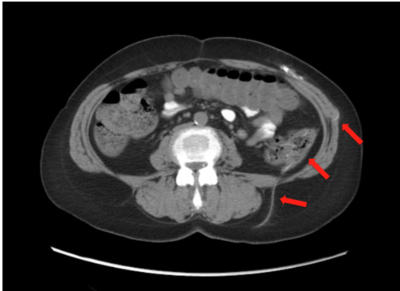 During the endoscopy, black tubing belonging to the baclofen pump was noted to be traversing large bowel (refer to figure 1). Follow-up CT scan showed that the distal end of the tubing was indeed in the intrathecal space in the lower lumbar region (refer to figure 2). Methods: A literature review was conducted using the PubMed® database, utilizing key words such as baclofen pump, migration, erosion, and complications. A thorough review of the results was conducted. 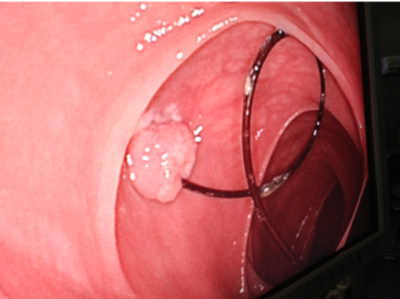 Results: After undergoing a thorough literature review, we describe, to our knowledge, the first reported case of baclofen tubing eroding through bowel, which was found in a patient with multiple sclerosis, underdoing elective GI endoscopy. Discussion/Conclusion: Baclofen pumps have been a mainstay of therapy for many years, targeting treatment resistant back pain and spasticity (1). However, the use of this adjunct therapy is not without its complications. It has been described in the literature that baclofen pumps have eroded through their subfascial pockets into the peritoneum in at least two patients (1,2). Baclofen pump tubing has been noted to migrate cranially, causing subarachnoid hemorrhages, and also subdurally, causing pump failure (3,4,5). It is therefore imperative that adequate follow-up and monitoring of implanted devices be conducted on a regular basis, to ensure continued safe and effective use. What is particularly interesting in this case, however, aside from the visual images, is that the patient a) described no GI symptoms related to the presence of the tubing, and b) reported, up until the time of the procedure, very good symptomatic relief from the pump.